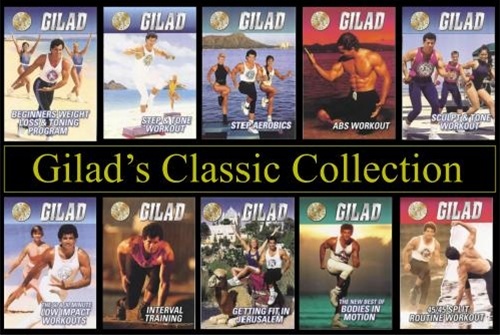 The best of Gilad's classic workouts. Bodies in Motion workouts these will ensure you many hours of great workouts. For more detailed description of each DVD see below. Love The videos, use to get your shows on cable 10 years ago,at 54 I got in The Shape of my life in 3 months .I Now am 65 so I am Starting at a slower pace Will gradually Get up to speed and Know I will get The same Results in Time .Thank You So much Better Than having to Go to the gym....among and The Shipping Time was Very fast ! . Go GILAD !!! Best workout ever. I’ve tried so many others and quickly got bored. I always seem to come back to you. Love it!!! The DVDS that I have done so far are good workouts. I lost 12 pounds so far. I Love Gilad! I started doing his workouts in 1985 and haven't stopped!